Join internationally renowned photography expert Alex Mustard to learn how to get the most out of your SLR rig in the Northern Red Sea at its seasonal best. On Alex' workshops, the sole aim of the diving is photography. We will be going to the sites that are most productive for images and will be repeating sites, sometimes several times, to give you the opportunity to work on shots, change lenses, wait for the light to be in the correct place etc. Much of the diving will be very shallow and the timing of the dives during the day will usually be quite deliberate to get the optimum conditions for certain shots. Alex will always decide on the itinerary of the trip with the dive guides and the Captain based on weather conditions and which sites are really producing. These are prodominately wide angle trips, but the Red Sea is teaming with macro life too and there are regular night dives. The overall aim of Alex' workshops is simply to help you all get the best possible underwater images in the Red Sea, to make the most out of the week's photographic opportunities. We'll achieve this by doing photography focused dives (right style, right time of day, repeating sites etc), by Alex giving you the photo advice and information you need before the dives and by Alex leading group review sessions where you can get advice, inspiration and feedback from the rest of the group. Alex will always be available to offer advice and ideas on a 1:1 level and he has build a strong reputation as one of the most dedicated and hard working trip leaders around. Alex will also cover some post processing tips (using Lightroom) during these review sessions, but the main focus of this workshop is getting the shots right in camera. As is well known, Alex' workshops do not have a competition element, which he feels greatly encourages an open, sharing environment on board for the exchange of ideas and information. Alex is proud that on his workshops you will not just learn from him, but that everyone in the group will bring interesting and valuable ideas and opinions that will benefit all our photography. Want to know more about Red Sea Photography Workshop? Red Sea Photography Workshop contains all the detailed information you need, a full day by day itinerary, pictures, videos, reviews, and other practical information. 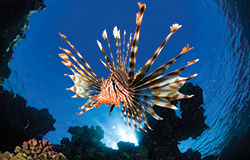 Or call one of our diving holiday experts on 0800 072 8221 or +44(0)1483 411590. Join Alex Mustard for a week focused on getting more out of your camera! Departing from Hurghada, you will spend 7 nights on board on a full board basis (twin share cabin). This based in Northern Red Sea with up to 21 dives over the week but the itinerary will vary, depending on the photo opportunities. All marine park fees, 12lt tank and weights are included in your package. All trips are fully guided with 2 expert guides. There will be evening presentations and 1:1 sessions with our photo pro. Flights are with EasyJet from Gatwick and transfers are also included. At the end of the week you will have day use of a hotel and buffet lunch while you wait for your flight home. Excluded are the Egyptian entry visa, alcohol, additional kit hire and any on board souvenirs. Please let us know if you would like to prebook any PADI courses on board or have any dietary requirements. We can also assist with purchasing excess baggage from the airline prior to travel. Please DO NOT book any connecting flights, insurance, or additional parts to this holiday as your trip is subject to availability and will NOT be confirmed until you have spoken with our operators. If you have any requests beyond our normal itineraries please note them in the comments and we will discuss these with you when we call to arrange your holiday. (3) flight inclusive packages that commence outside of the UK and Republic of Ireland, which are sold to customers outside of the UK and Republic of Ireland. 1, 2, 3 and 4 provides for a refund in the event you have not yet travelled. 1 and 3 provides for repatriation. Please note that bookings made outside the UK and Republic of Ireland are only protected by ABTOT when purchased directly with Scuba Travel (Tony Backhurst Scuba ltd t/a Scuba Travel).